Gunter Welz measured Fairy Bridge by laser rangefinder on October 16, 2010. 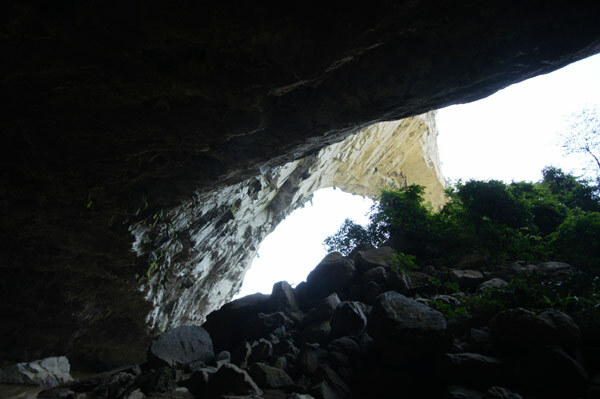 A group from the Natural Arch and Bridge Society, led by Ray Millar, visited Fairy Bridge in China on October 16, 2010. During this visit measurements by Gunter Welz established that the span of the opening is 400 ± 15 feet and confirmed that the arch has the greatest known span in the world by a wide margin. Measurements were made from a boat with laser rangefinders. The raw data (in meters) are shown in the photos above. In the top photo, the upper ranged point is obscured by foliage. All observers agree that the correct points of the arch were ranged (the rangefinder was panned around the upper ranged area until the correct point was located). The lower ranged point was 5 meters from the boat (measured with a Leica DISTO Laser Distancemeter). The distance to the upper ranged point was 138 meters (measured with a Laser Rangefinder 800 from Vollmondjagd.de, which has a range of 800 meters and a rated accuracy of ± 1 meter). These numbers were subjected to two corrections: (1) The boat was not directly between the two ranged points, but was very slightly upstream. This incurred a calculated reduction of 2 meters from the result. (2) The distance to the upper point needed to be corrected by the angle to the horizontal to obtain the span (which is the horizontal extent of the opening). No equipment was available on site to make any precision measurement of this angle, so this introduced some error. The angle was calculated to be 30° using photoanalysis of numerous photos. Note that in the photos above the angle appears less than that because the photos are not taken at right angles to the opening. An error of 1° in the angle results in a difference of about 4 feet in the calculated span. The result was a span of 400 feet with an estimated error of ± 15 feet. This clearly establishes Fairy Bridge as the longest known natural arch in the world, by a wide margin. Gunter also measured the height of the opening at close to 230 feet. 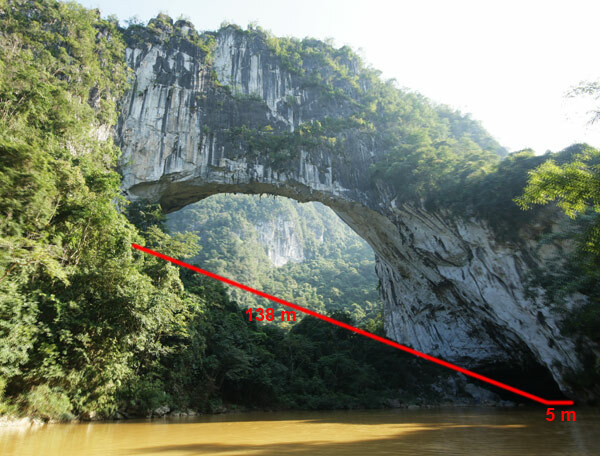 Chinese websites have been found which report the span for this arch to be 177 meters (580 feet). This clearly is not a measurement of the opening itself. As one approaches the arch from upstream, the river turns sharply right within a huge alcove undercutting the rock. Part of this alcove can be seen on the left in the second photo above, and part of it would extend behind the photographer. More of the alcove can be seen in the photo below. 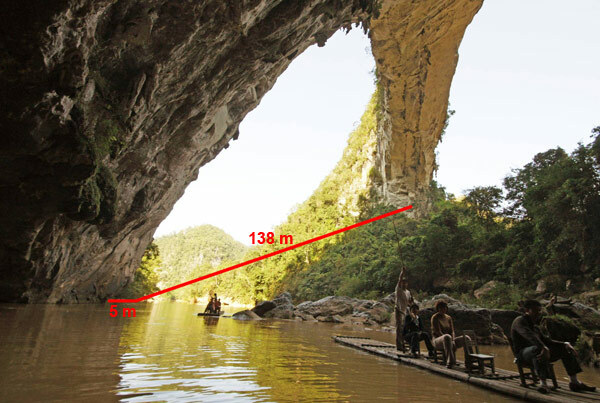 It seems likely that the measurement reported by the Chinese includes the extent of this alcove (a common practice). NABS does not use such measurements because of the difficulty in defining the points to be measured, and the even greater difficulty in comparing such points with arches of differing geometries. Part of the alcove adjacent to Fairy Bridge. Photo by Gunter Welz.